Ananova: Winner wont claim $1m prize due to hoax fear. PhysicsWeb: Nanotubes are the new superconductors. Check out the picture on this page. What on Earth were they thinking? Frontier News: New verbs for Frontier and Radio: table.tableToXml and table.xmlToTable convert tables to XML and back to tables. Here’s the spec for Frontier tables in XML. soap:Client : Server was unable to read request. --> There is an error in XML document (8, 31). --> SOAP-ENC:arrayType with multidimensional array found at <input2DStringArray xmlns=''>. Only single-dimensional arrays are supported. Consider using an array of arrays instead. CNN has a page of key facts about the War Crimes Tribunal. Dictionary.com Word of the Day: peremptory. 500 ways to annoy your roommate. 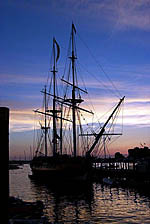 If you like tall ships, David Rogers has a picture for you. BBC: Strange glows on Jupiter moon. Red and blue dancing glows were seen on Jupiter’s moon Io during a recent flyby. What’s the mob up to this week? Wait a minute… What are those CalTech people doing with that four-ton obelisk? George Hupka has a list of the worst Country song titles: everything from “All My Exes Live In Texas” to “You’re The Reason Our Kids Are So Ugly”. Three new Themes for Manila sites: Slab-Red, Slab-Green and Slab-Blue. Dictionary.com Word of the Day: oblation. BBC: Back to the future for Atari games. Classic arcade games could soon be resurrected on future mobile phones. Unfortunately, “current generations of phones will not be able to get hold of and run the games. Those keen to play them may have to invest in a new gadget to relive their adolescence.” Drat! Dictionary.com Word of the Day: mephitic. CIA says it can’t keep up with hackers (CNET). Gee, I wonder who else is re-writing my websites, reading my email, tracking what I purchase, brainwashing me, monitoring my location, or keeping an eye on what’s planted in my back yard via spy-sattelite? Brent has a simple how-to on turning off Smart Tags. CNET: Dell CEO expects more dot-coms to fail. “The head of the world’s largest PC manufacturer says he sees more dot-com firms collapsing amid fierce competition before the computer technology sector stabilizes.” Duh.